McDonald's unleashes Angry Bird Desserts this hot hot summer! McDonald's brings out the fun with the new Angry Bird Desserts! 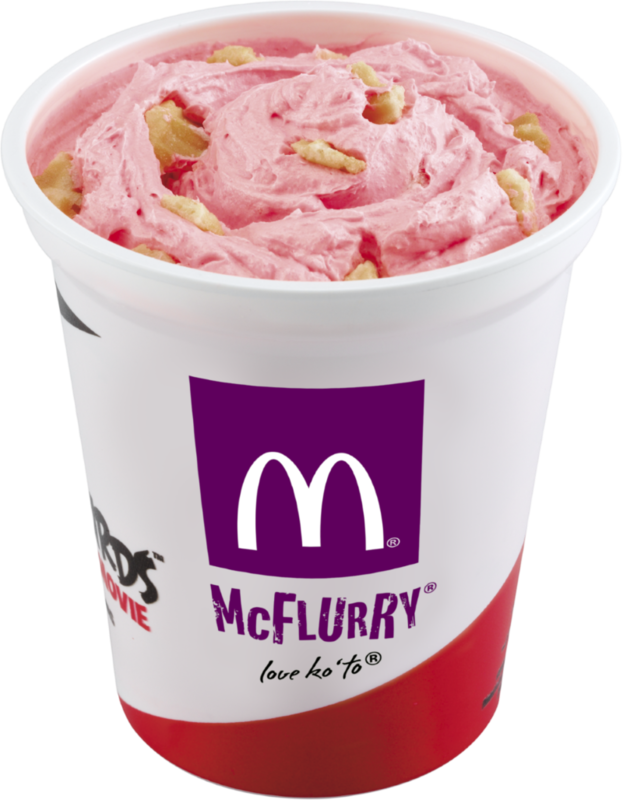 Taking inspiration from the highly addicting Angry Birds Game and the upcoming Angry Birds Movie, McDonald's brings the action to their newest dessert line-up for us to be part of the awesome fun this hot hot summer. Now available, customers can have a unique summer experience as McDonald’s unleashes the new Angry Bird Desserts. 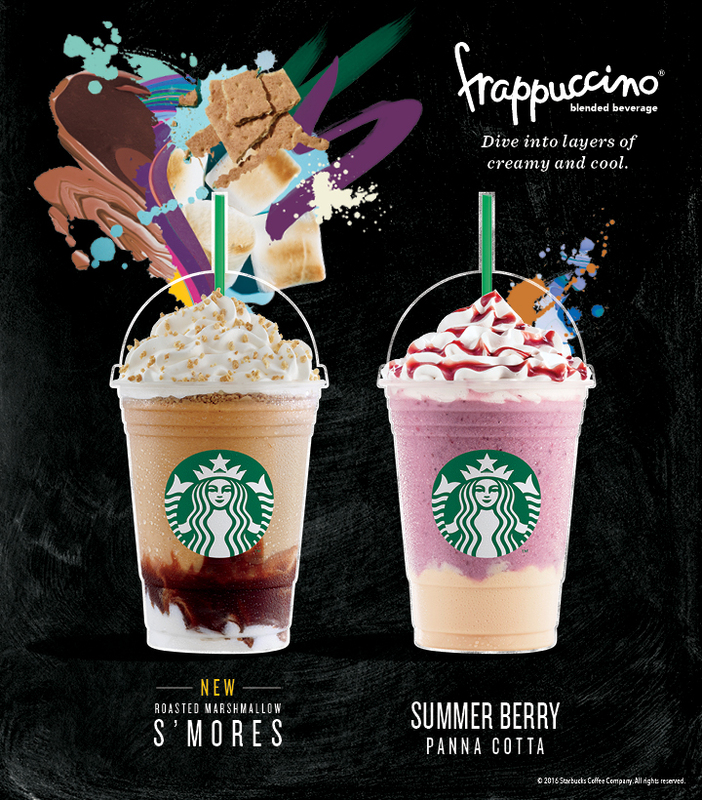 Three furiously fun treats are up for grabs to satisfy one’s sweet cravings and keep cool during the bright and sunny season. Resorts World Manila, is known as one of the country's biggest destination for work and play, not known to many, they also house one of the most diverse dining destinations this side of town, with that let me take you to a journey, a food crawl to some of Resort World Manila's many dining pleasures, you'd be pleasantly surprised at these fabulous selections. Yup this is the headline for today! Don't Drive Hungry! In they busy streets of Metro Manila, you really have to have a lot of patience and will power to keep your cool when on the road. Traffic everywhere, as soon as you leave your house, you are greeted with a lot of... traffic haha! When drivers get hungry, they end up doing crazy things on the road. So SNICKERS® is reminding people not to let hunger get in the way of their driving as they launched the Don’t Drive Hungry Initiative last April 23. Breakfast Dimsum Buffet Weekends at Crystal Jade Dining IN, Reason enough to wake up early on the weekends! Crystal Jade Dining IN Breakfast Dimsum Buffet Weekends are here!! 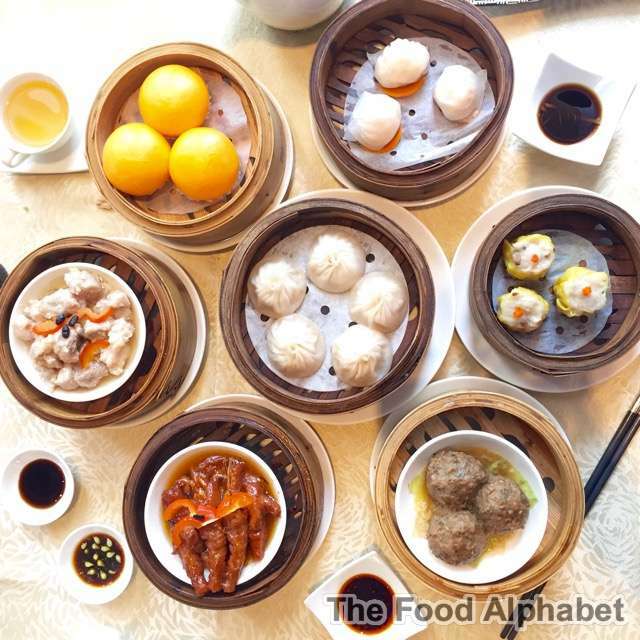 It's another lazy weekend, but I'm definitely waking up early for Crystal Jade Dining IN's Breakfast Dimsum Buffet!! Yes it's back! And much, much better than before. I'm a sucker for Dimsum and all the more excited since I know Crystal Jade serves up one of the dimsums in the metro! For only P688 nett you get to enjoy Crystal Jade's best dimsum offerings freshly steamed upon order, you only just need to dream about it for a while, then it becomes a reality! Snickers gives away FREE temporary car license plates, launches "Don't Drive Hungry Initiative"
New car? No license plate? Don’t fret because Snickers is giving away free temporary license plates to car owners on April 23 at the Capitol Commons Carpark. Make your car cool, with temporary License plates from Snickers!!! The event is the launch of Snickers Don’t Drive Hungry Initiative, a road safety initiative reminding drivers not to let themselves get hungry while they’re on the road. 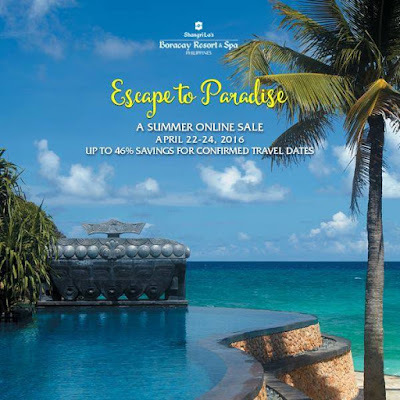 This is your chance to own a piece of paradise as Shangri-La’s Boracay Resort and Spa, Philippines is launching an online summer sale from April 22 to 24, 2016 via www.shangri-la.com/boracay. Guests may enjoy up to 46% savings on luxurious accommodation at the country’s premiere resort destination for confirmed travel dates until April 2017. Is your name Joy? May libre kang Chicken McDo! 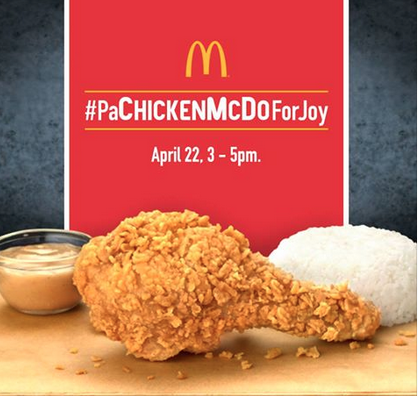 FREE Chicken McDo for every Joy! Araw mo, Joy! This April 22 from 3 - 5 pm only! Libreng Chicken McDo para sa iyo, pati isang friend mo, libre rin! Just bring a valid ID to identify that you are indeed named Joy! Joy may be spelled as Joi, Joyce as long as your name sounds like Joy then you and your friend can get a Chicken McDo FREE! Check www.mcdonalds.com.ph for list of participating stores. Summer is definitely here!! With temperatures going almost 40 degrees and with heat index climbing higher and higher, you should watch out and do rehydrate once every often. And living in a tropical country, Filipinos have learned to enjoy the summer heat and stay cool, and enjoy summer and refresh ourselves in every way possible. This summer Starbucks brings to us two limited edition summer flavors that will surely rejuvenate you starting this April 19th! 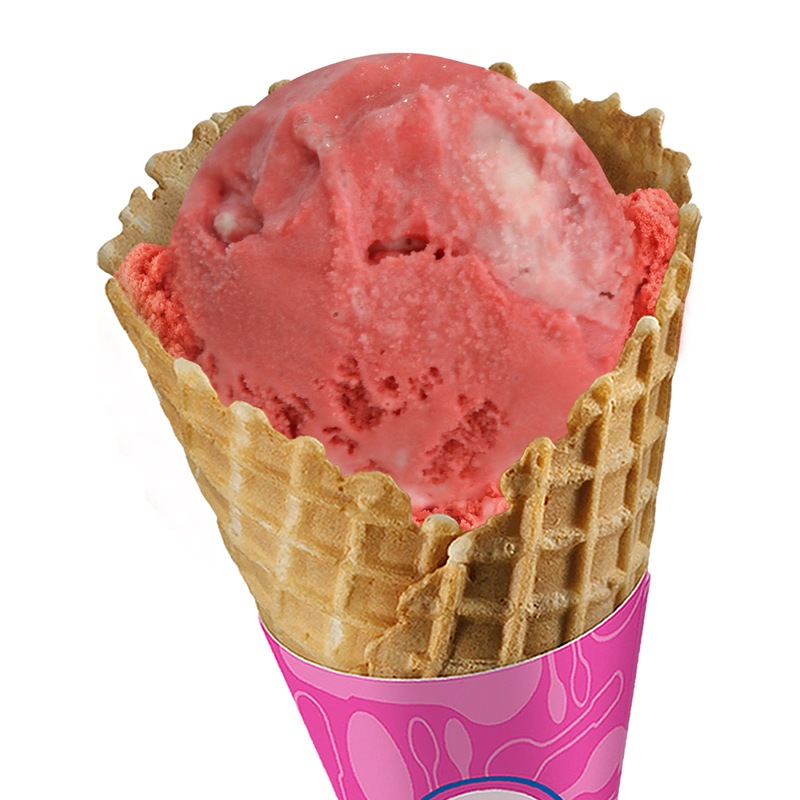 Beat the summer heat and cool off with Baskin-Robbins’ luscious April flavor of the month – Pomegranate Swirl. The world’s most beloved ice cream brand has deliciously combined unique pomegranate ice cream and classic vanilla ice cream, swirled with a sweet and tart pomegranate ribbon. Get ready for summer and plan for a V-cay in style! Check out exciting travel deals from our esteemed properties; Discovery Shores Boracay, Club Paradise Palawan and Discovery Country Suites Tagaytay! Visit “A World of Discovery” Travel Mart at The Podium in Ortigas from 15 to 17 April 2016 and enjoy up to 60% off on great deals perfect for the summer season. 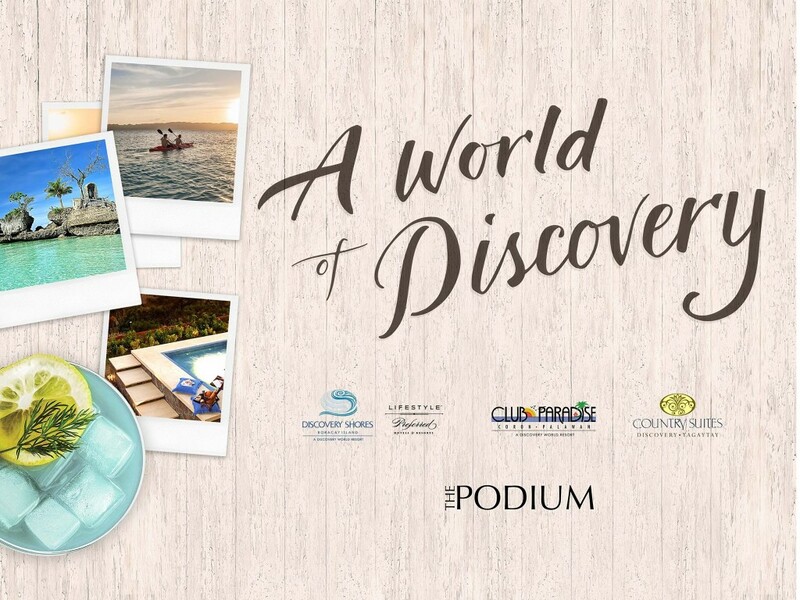 Get an additional 10% off on food and beverage at Discovery Shores Boracay and Club Paradise Palawan when you book and buy at The Podium. 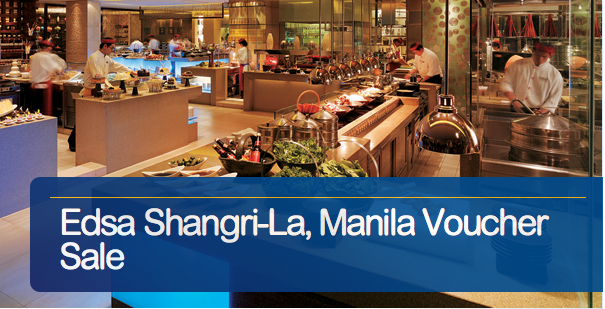 Edsa Shangri-La, Manila Heat and Staycation Voucher Sale!!! This is it!!! Edsa Shangri-La Manila is having a HEAT and Staycation Voucher Sale this April 15th-17th, 2016! Weekend Fun at F1 Manila - For the kids and the little kid in all of us! This summer, F1 Hotel Manila has turned weekends into family holidays! Check-in to fun-filled city getaway for the whole family especially for our LITTLE VIP’s—your Kids. Spend quality time with the whole family and have the best staycation ever at F1 Hotel Manila. Celebrations at Hotel Jen's First Anniversary! Just recently Hotel Jen, the newest member of the Shangri-La Group of Hotels, celebrated their 1st Anniversary in full fiesta mode and they did it in style. 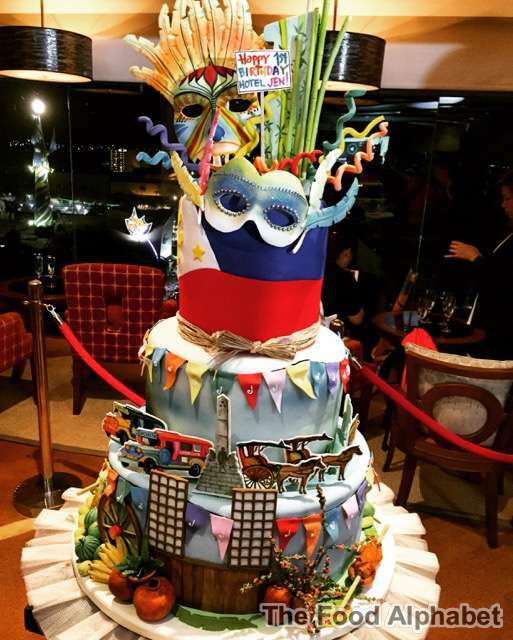 Not only did Hotel Jen Philippines hold a grand celebration, all Hotel Jen's simultaneously spread the cheer from China to Hong Kong, down to Malaysia and Singapore, all the way to Maldives, making it one of the grandest Anniversary Celebrations ever. Savor the taste of summer as Villa del Conte brings you its fruit-flavored chocolates! Go bananas this sunny season with Villa Del Conte’s milk chocolate with banana cream filling; beat the heat as you bite the refreshing milk chocolate with watermelon cream filling; and freshen up with the taste of citrusy dark chocolate with orange cream filling. Enjoy these sweet treats at Villa del Conte stores at Greenbelt 5, Century City Mall, Shangri-la Mall, SM Megamall, Resorts World, Alabang Town Center, and Robinson’s Magnolia. Go to http://www.villadelcontecioccolato.com/ to know more about Villa del Conte, or follow them on Facebook: https://www.facebook.com/VillaDelContePh, Instagram: http://instagram.com/villadelconte and Twitter: https://twitter.com/VilladelConte. 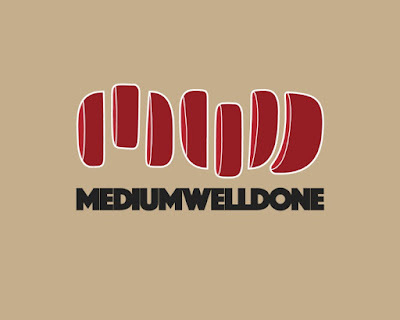 Catch the wagyu steak pop-Up store, MediumWellDone at Hole in the Wall - For a limited engagement only! Treat yourself to a wagyu steak for under P500 at Hole in the Wall's new pop-up. Steak, simplified. Steak made just the way you like it, the right way. For the next two weekends, Mediumwelldone gives you flat iron wagyu steaks served with generous portions of french fries and gravy—for just P495. 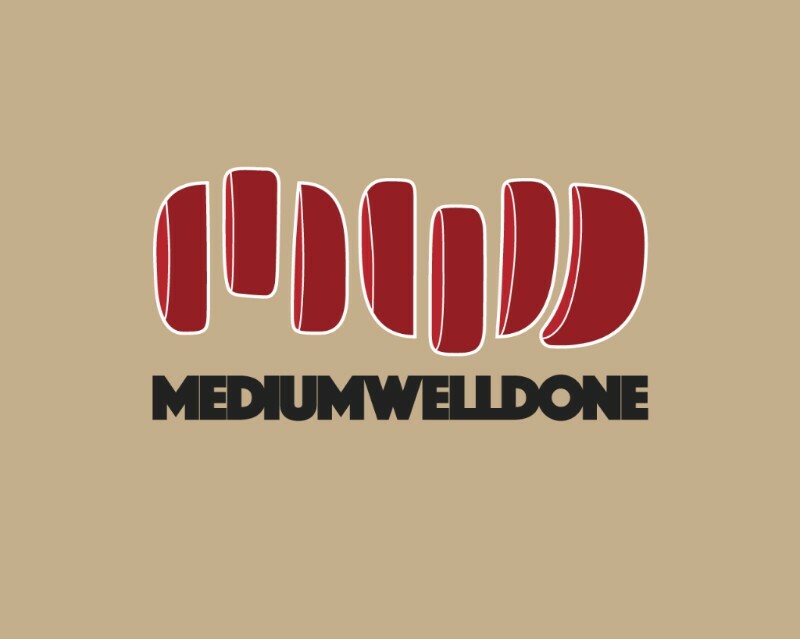 Mediumwelldone is the brainchild of meat-loving cousins Chef Miko Calo, former Assistant Sous Chef of L'ATELIER de Jöel Robuchon Singapore; and RJ Galang, founder of ManMade Infused Finishing Salts. Heard of the Underground Supper Club? That's them. Following the success of the previous nationwide culinary fiesta, Diamond Hotel Philippines again participates in a grander celebration of the second Madrid Fusion Manila with FIESTA DE SABORES ESPAÑOLA, a Spanish Food Festival at its premier dining destination Corniche. The hotel has invited guest chef Edgard Sanuy Barahona to prepare authentic Spanish cuisine from April 4 to 10, 2016. Taste a vast range of Spanish dishes at the buffet as Diamond Hotel once again participates in the celebration of Madrid Fusion Manila. 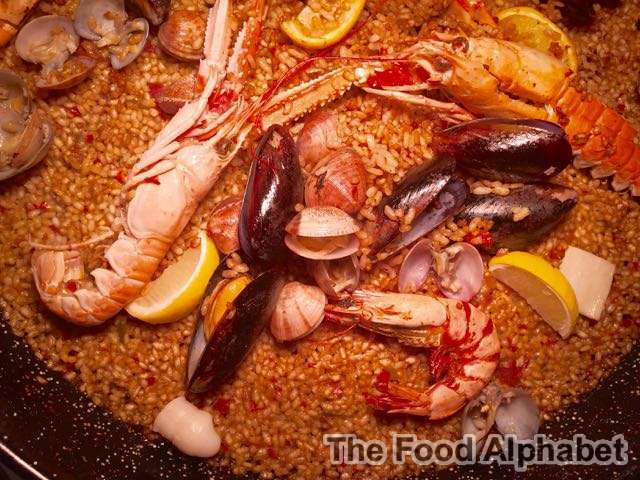 Experience a mix of fresh and flavorful ingredients that makes Spain one of the countries with the richest and most varied of cuisines. 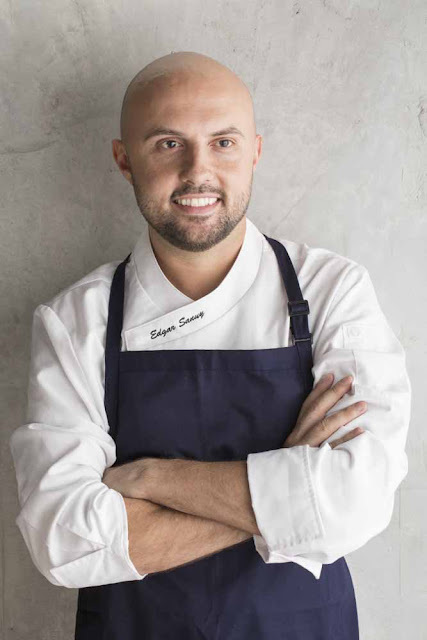 Chef Edgard comes from Lleida, Spain from a family of famous chefs. He was the first Spanish chef to receive a Michelin star in Asia and has worked in several Michelin-starred restaurants. 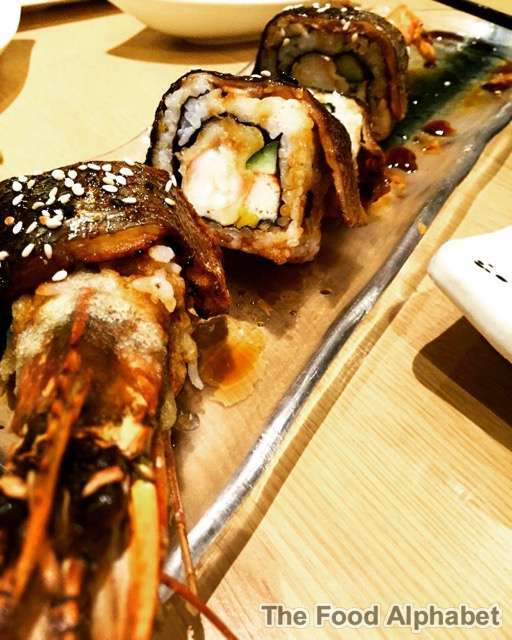 Currently, he works as the Corporate Chef of the Maximal Concepts Group and was hailed as the Chef of the Year 2013 by Foodie Magazine in Hong Kong. Do you have to deal with unexpected scenarios that make your day longer than usual? Last minute calls that you have to take; long lines to get a ride going home; or a sea of hazard lights that will cost you another hour or two? No need to worry because McDonald’s offers more reasons to help you get through them with its new merienda items. 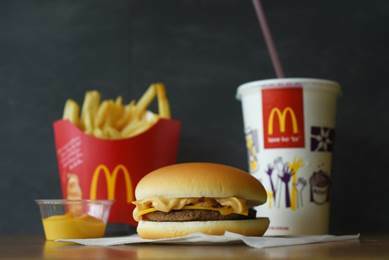 Get through the day even if it’s not going according to plan with McDonald’s new Smoky Cheeseburger and World Famous Fries now offered with Nacho Cheese or Honey Mustard dip. Class of 2016! Reward yourself with a FREE Buffet at Four Seasons Hotpot! 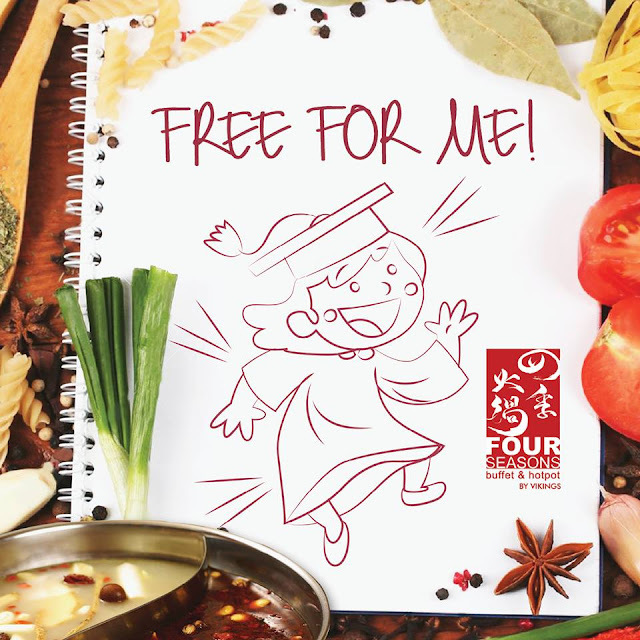 Congratulations Graduates of 2016, You truly deserve all the credit, all you hard work has finally paid off and what better way to give yourself a pat on the back other than to reward yourself to a FREE BUFFET! Buffet all you can! 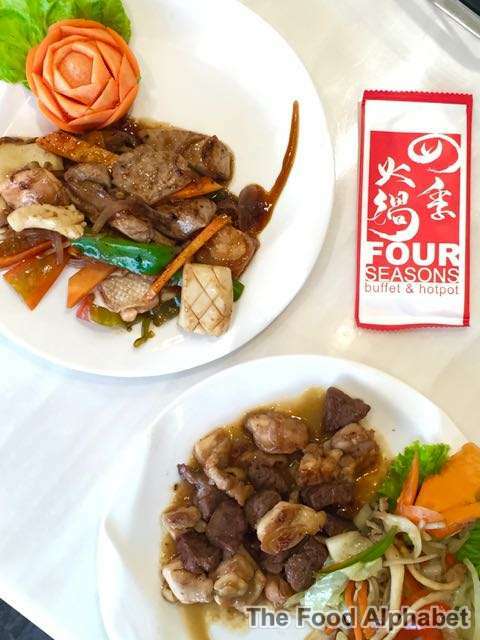 Four Seasons Hotpot knows you did your best to achieve where you are now, and it's their way of saying "Congratulations, the journey was tough, but you did it, so Let's Celebrate!" 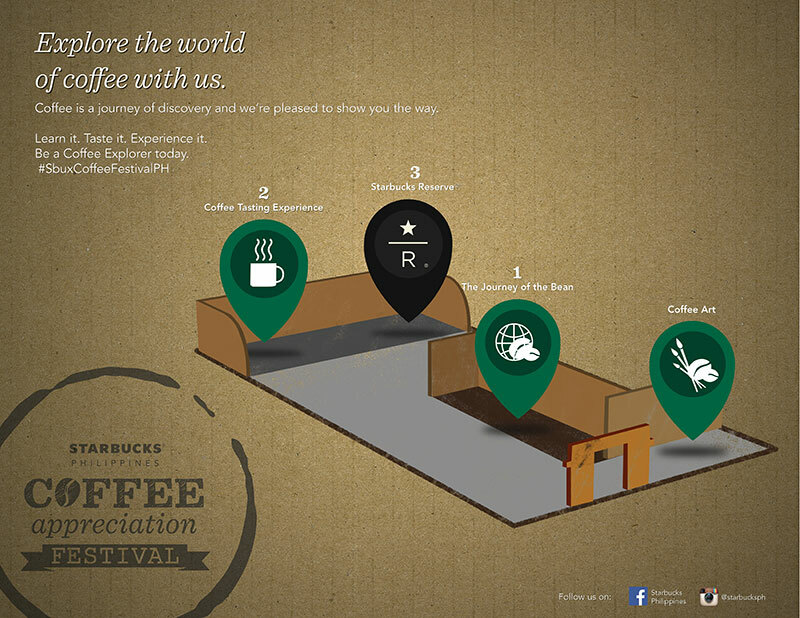 Starbucks presents "Coffee Appreciation Festival"
A cup of Starbucks coffee is the result of a long voyage starting with farmers picking coffee cherries from trees and ending with highly-skilled baristas masterfully brewing each cup. Explore the world of coffee with us on our first-ever Coffee Appreciation Festival and witness coffee tasting and brewing demonstrations. 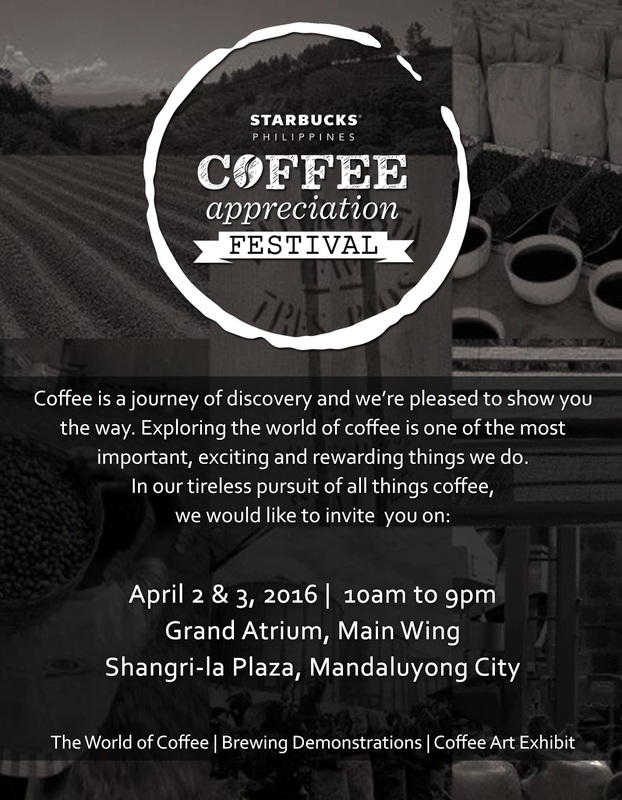 Savor the rich blend that goes to your every cup of Starbucks Coffee.